As end-times prophecy is being rapidly fulfilled, the rapture is an increasingly relevant and important topic of discussion. But not everyone agrees on when this event will occur. There are four main positions being taught by those holding a premillennial position today (belief in a literal thousand-year reign of Christ that is yet future): pretribulationism, midtribulationism, posttribulationism, and prewrath. What are the differences between these positions? The Bible teaches that the cup of man's iniquity will one day be full, and God will pour out His righteous judgment upon the earth. This judgment will come in three waves: the seal judgments, the trumpet judgments, and the bowl judgments, with each increasing in intensity. At the end of this period, which will last seven years, Jesus will ride forth to destroy the wicked and unbelieving, and claim His rightful throne. But before God pours out His wrath, however, the Bible promises that Jesus will rapture His Bride, the true and faithful Church, by whisking believers away to heaven, without experiencing death. The pretribulation rapture position teaches that God's wrath will start at the beginning of this seven-year “tribulation” period; therefore, the rapture will occur before this period begins. The midtribulation rapture position teaches that God's wrath will occur midway through the “tribulation” period; therefore, it the rapture will occur midway through this period, as well. The posttribulation rapture position teaches that God's wrath, and therefore the rapture, will occur at the end. Recently, there has surfaced a new position, the prewrath position. Like the midtribulation position, prewrath teaches that the rapture will occur midway through the seven-year “tribulation” period (which is more accurately called the 70th Week of Daniel, from Daniel 9:24) but before God's wrath. The difference from midtribulationism is that, instead of placing the rapture at a nebulous “midway” point, it places the rapture in a specific, well-defined position in the timeline of end-times events (this is not date-setting — only determining chronological sequence). There are also three other popular end-times positions today: the preterist position, which teaches that all of the events of Matthew 24 (including the rapture) occurred in the first century, culminating with the destruction of the temple in A.D. 70; the historist position, which teaches that end-times events have been fulfilled gradually throughout history; and the ammillennial position, which teaches that there is no literal millennium and that the teachings of Jesus on the end-times are symbolic only. Because the writings of John in The Revelation, written around A.D. 90, make it clear that the church was still looking for the Antichrist and the Second Coming of Christ after the destruction of the temple; and because I am among those who insist on a literal, natural interpretation of the scriptures over symbolism, I will not deal with these three positions here. However, I do deal extensively with preterism in later columns. Here, I will look only at those four positions that are founded on a premillennial viewpoint: pretribulationism, midtribulationism, posttribulationism, and prewrath. What is the biblical basis for each of these positions? Pretribulationism: Despite the growing popularity of pretribulationism, there is no direct scriptural evidence for the pretribulation rapture. Even top pretrib scholars admit that this timing must be inferred and that there is no direct evidence that Jesus will return prior to the 70th Week. The primary evidence for this position is the sense of expectancy for Christ's return throughout scripture. Pretribulationism interprets this expectancy as requiring an "any moment" event. The closest most pretribulationists can come to scriptural support for their position are indirect references like, “we are not destined for wrath” (1 Thess. 5:9), “the day of the Lord will come as a thief in the night” (1 Thess. 5:2), and “no one knows the hour or the day” (Matt. 24:36). But upon closer examination, these verses do not support the position that pretribulationists are trying to erect. God's wrath does not start at the beginning of the 70th Week; the day of the Lord comes as a thief only for unbelievers, not for the Church; and although no one knows the hour or the day, Jesus gives clear, specific signs that will point to His return. Posttribulationism: This position comes largely from Matthew 24, in which Jesus outlines the events that will occur during the latter days. He describes the wars and rumors of wars, the famines, earthquakes, and other disasters, the rise of the Antichrist, the Great Tribulation, the cosmic events in heaven, then His return on the clouds, with the trumpet of God, to gather together the elect. 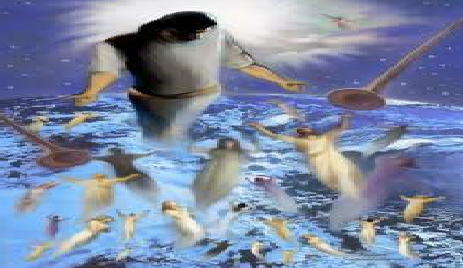 Posttribulationists see Jesus' coming on the clouds in Matthew 24:30 as the same as His coming in Revelation 19, when He arrives in the clouds with the heavenly host immediately before Armageddon. Therefore, they teach that the rapture will occur after the seven-year “tribulation” period and just prior to Armageddon. To support their position, posttribulationists point to the striking similarities between Jesus' coming on the clouds and the gathering of the saints in Matthew 24:30-31 with other key rapture verses like 1 Thessalonians 4:16-17 and 1 Corinthians 15:52, which are similar, almost down to the word. Thus, they conclude, these verses must be referring to the same event and that these events occur at the end of the seven-year "tribulation" period, coinciding with Jesus' coming described in Revelation 19:11-16. To support their position, posttribulationists also point to the striking similarities between Jesus' coming on the clouds and the gathering of the saints in Matthew 24:30-31 with other key rapture verses like 1 Thessalonians 4:16-17 and 1 Corinthians 15:52, which are similar, almost down to the word. Thus, they conclude, these verses must be referring to the same event, not two different events (as pretribulationists teach), and that these events occur at the end of the seven-year "tribulation" period, coinciding with Jesus' coming described in Revelation 19:11-16. Midtribulationism: Like posttribulationists, midtribulationists see the descriptions of Christ's coming in Matt. 24:31, 1 Thess. 4:16-17, and 1 Cor. 15:5-52 as the same event. However, they insist that the eager expectation for Christ's return taught in scripture is damaged by the posttribulational belief that the rapture occurs after the conclusion of the 70th Week (seven-year “tribulation” period). They also point to the heavenly host clad in white linen that comes with Jesus at Armageddon — who are these heavenly beings, if they are not the Church? And if they are the Church, and if they come with Christ at Armageddon, they must have been raptured sometime earlier in the 70th Week. Midtribulationists also argue that, should the rapture occur at Armageddon, after Christ destroys all the wicked, there will be no one left to populate the Millennium. Because the Bible clearly teaches that there will be people living on earth during the Millennium, they argue that the rapture cannot be a posttribulational event. Thus, they teach that the rapture must occur prior to Armageddon, allowing for an interval of time for new believers to be won to the Lord during the 70th Week and prior to Armageddon. Despite the valiant attempts of midtribulationism, this argument relies on inference, and like pretribulationists, who also rely on inference, midtribulationists have a difficult time finding a clear, direct reference to the rapture in the biblical timeline of events. Prewrath: For many years, the rapture debate was waged between three positions, each with their strengths and flaws. No resolution was possible. Then came a new understanding of the timing of the rapture — not a new timing, but a formal defense of an existing understanding — the prewrath view. The prewrath argument combines the strengths of the posttribulation rapture position and the midtribulation rapture positions, while maintaining a level of biblical consistency not possible with either. Like posttribulationism, prewrath sees Jesus' coming on the clouds in Matthew 24 as the rapture. It also agrees that the word-for-word similarity between Matt. 24:31, 1 Thess. 4:16-17, and 1 Cor. 15:52 argues strongly for these being the same event. Prewrath does not, however, see Jesus' coming on the clouds in Matthew 24 as the same event as in Revelation 19. Rather, a comparison of Matt. 24:29-31 shows that it is a near word-for-word description of the sixth seal (Rev. 6:12-17) and that Jesus' coming in Revelation 19, which has a number of differentiating details, is a different event for a different purpose. wrath, among others — also point to the sixth seal as the critical turning point in end-times prophecy when Jesus returns as conquering King. Thus, the prewrath rapture teaches that Jesus' Second Coming, and therefore the rapture, occurs after the opening of the sixth seal and before God's wrath. While many would argue that the timing of the rapture does not matter, that it is simply a nonessential doctrine that is best avoided, I disagree. I believe that believers are accountable for discerning the truth of God's Word and that a believer's determination will have a substantial, practical implications for the way they live their lives. I encourage readers to look more deeply into each of the rapture positions, comparing them to what is clearly taught in the pages of the Bible. Jesus did not intend for His coming to be a secret, mysterious event. The Bible refers to the Second Coming nearly 400 times. This is an important issue, and God wants His children to understand it so that they can prepare.